I have had the good fortune (as a band wife) to spend the last two Sundays at the new Los Senderos Bistro, eating thoughtfully prepared, delicious food in an environment that is really lovely, and unlike anything I have seen in San Miguel (or anywhere else for that matter). Brunch and lunch are served on an open-air patio, sheltered by two gorgeous mesquite trees. The views are spectacular, across green fields to far hills, with an artfully placed horse or two in the near distance. Decor is rancho-chic yet relaxed, in Los Senderos' signature colors of teal and olive. Right next to the restaurant is a large organic garden where all of the restaurant's produce is harvested. Next to the garden is a handsome square concrete pond, soon to be stocked with tilapia. A few feet away, another touch of whimsy: two ostriches in a pen. (Have you ever looked at one of these creatures up close? Weird and wonderful!) Creative attention to detail is everywhere you look. When you visit the Bistro, you can hop on a bike and ride around sensuously curved roads on 275 acres of grounds. Or take a hike, as Doug and I did last Sunday, though a landscape that is dotted with stone ruins and manages to be manicured yet wild at the same time. You can toss a few bocce balls at the Bistro's court. Or you can just soak in the views and listen to live music, thoughtfully provided on Wednesday evenings around 7:30 and on Saturday and Sunday from 1-3:00 pm. The food may not fit everyone's budget...but folks, this is a destination restaurant, not a taco stand. And as far as I know, no one has yet been turned away for ordering a sandwich and a beer. Los Senderos is easy to get to. On the libramento, there is a road that runs right alongside and to the left of the Las Alamedas development. Signs abound. In about one minute you'll reach the interior gate to Los Senderos and be directed to the Bistro. Hours are from 11 am to sunset, Tues, Thurs, Sat, and Sunday; 1-9 pm Wednesday. You can call (415) 155-9571 for reservations. In short, Los Senderos Bistro is a feast for the senses: a wonderful place to bring guests, celebrate a special occasion, or just treat yourself to a few hours basking in a tranquil environment created with a great sense of style. If you travel the country you will find unique places like this one or even better. Also, there are great locations which should be visited worldwide. For instance, there are many attractive offers at the French Riviera vacations and if you want to travel abroad this region should be on your bucket list. Great site having a lot of amazing and very informative article. I'm very happy to find this website and like to say thanks for this post. Los Senderos Bistro is very beautiful place to spend time with wife. Infect, the dishes also amazing in taste because it's my personal experience. Last month I have passed night at that place which is very enjoyable for me. Therefore, When I saw this post about it then like to read about it and say some words as well. However, I also need bestessays review but i don't know which one is best offering similar work which i want. The topic here i found was really effective to the topic which i was researching for a long time. Although there are many restaurants in San Miguel de Allende that offer fine food, there is nothing quite like Los Senderos for combining fine dining with the exquisite experience of the campo. From the moment you drive through the gates, you are in a world of mesquite trees and nopales with vistas across the Los Senderos landscape. It is not uncommon to while away an afternoon, enjoying the atmosphere, long after you have finished the great meal. The cuisine of Los Senderos's new chef Warren is a delight and the welcoming atmosphere makes it easy to stay and stay and stay. Watching riders trotting by, visiting the organic gardens adjacent to the restaurant and the "tienda" that sells its products, walking (or biking) the grounds, listening to the sounds of the musicians who play there regularly--it's a view into a harmonious way to live. Watch horses and sheep graze in the field below the restaurant, walk past the lovely water pool with fountain through the gorgeous organic garden and then eat a delicious salad from that very same garden. You can even buy some delights in the little store by the garden, home made things and veggies. I tell everyone to go there! 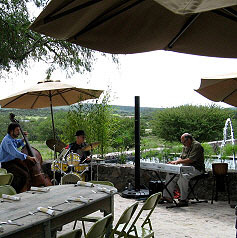 Bistro Los Senderos is the most enchanting setting for a Sunday lunch, a wedding, a reunion. The roast beef sandwich with homemade horseradish is the best I have ever had. The organically grown lettuce is a real treat. The Tortilla soup with shrimp is mild, delicious and beauifully presented. The bread and olive oil dip were perfection. My only sugesstion would be to offer a few less expensive entrees for those who would love to experience the Bistro. The service is excellent, polite waiters and warm staff. Thank you for the great addition to San Miguel, for those of us who live in the country. Join in and write your own page! It's easy to do. How? Simply click here to return to YOUR Favorite San Miguel Restaurants Reviews.